Such is the talent of Russian hockey megastar Alexander Ovechkin that the Washington Capitals have bet their future on the youngster with a colossal 124 million dollars contract over 13 years. Since the Capitals drafted him number one in 2004, the giant Moscow native has begun writing his own chapter in NHL history. He is also the cornerstone of his national team's hopes of winning their first Olympic hockey gold since the end of the Cold War. The former Soviet Union dominated the international game and won seven titles between 1956 and 1988 as well as the gold under the banner of the Unified Team in 1992 at Albertville. Now Ovechkin has reignited Russian hopes after leading them to the world championship in 2008 and setting a string of records in the NHL where he has already set the league on fire. Unsurprisingly he comes from a rich sporting family and his father was a professional footballer while his mother won two Olympic golds as part of the Russian basketball team that competed in 1976 and 1980. After leading Russia to the world junior crown in 2002, he became the youngest ever Russian to be selected for the crack national team when legendary coach Victor Tikonov picked him to wear the famous red jersey at just 17. His NHL career began in disappointment when the 2004-05 season was wiped out due to a player-owner dispute but he quickly put that behind him to be named best first year player in his first full campaign. Ovechkin picked up the Calder Trophy as best rookie by passing the mythical total of 50 goals by two and accumalating 106 points while missing just one match in the tough 82 game season. 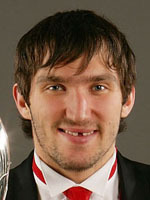 He has been an NHL all-star in every season since he joined the Capitals and also picked up the - not to be sniffed at - distinction of being named best Russian player as well. In his first appearance at the Olympics, Russia finished out of the medals at Turin 2006 after losing the bronze medal match to Czech Republic. He tucked away 65 goals in the 2007-08 season, a record for a left-winger and won the league's Most Valuable Player award, a first for a Washinton player in any sport since American footballer Joe Theismann in 1983. He tailed off slightly in 2008-09 with 56 goals but still racked up 110 points as the Capitals climb the NHL rankings at blinding speed. He is also the only player to win all four individual NHL trophies and did it in the same season as well. The sky is the limit for Ovechkin both at club and international level as Washington and Russia go looking for the top honours in the game.